The garden as it looked in the mid 1960s. This area was formerly laid out as a tennis court. 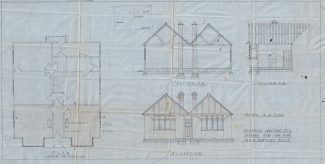 Plans for the extension to the bungalow. 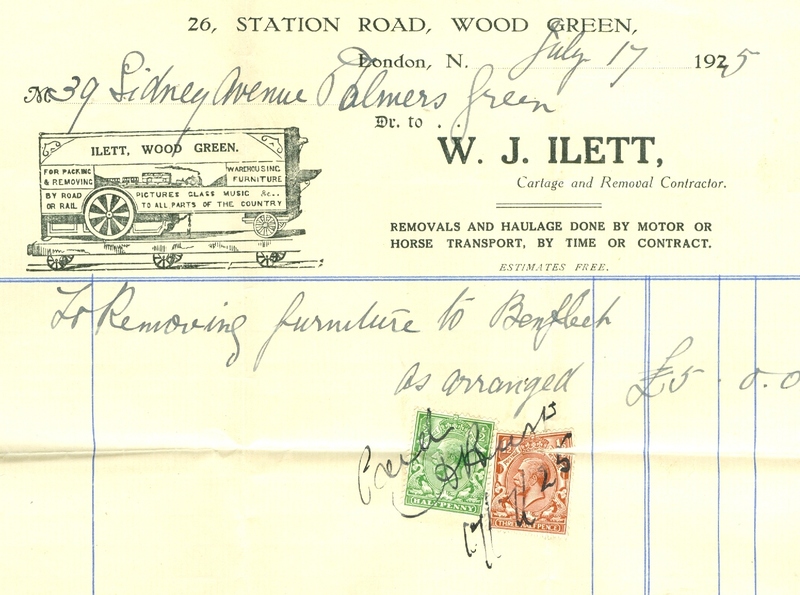 My mother-in-law’s parents, Harry and Beattie Martin, moved from Palmers Green to Benfleet in July 1925 when their baby daughter, Audrey, was just twelve months old. 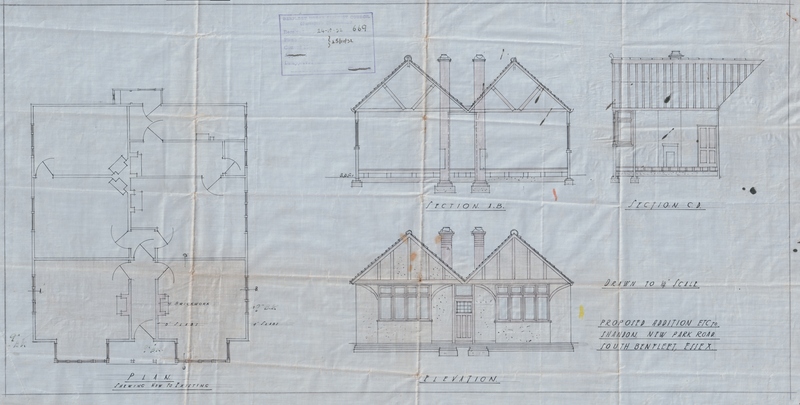 Their new home was a small bungalow called “Shandon” occupying three 20ft building plots in New Park Road. I’m not sure when the bungalow was built but, as there were no houses in New Park Road listed on the 1911 census, it was presumably constructed some time between then and 1925, probably in the early 1920s. 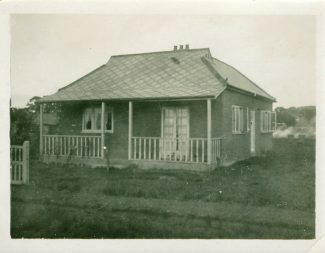 The bungalow was positioned sideways-on to the road, the front door facing south towards what is now Appleton School playing fields. 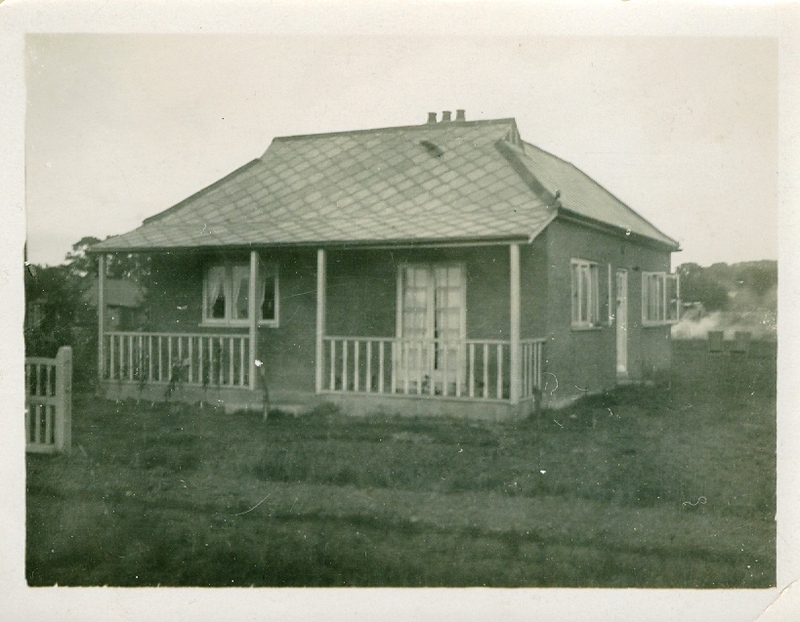 The original building had a verandah at the front with a central front door and four internal rooms. On the left-hand side were two bedrooms, one behind the other, whose windows faced onto the road. On the right-hand side were a sitting room to the front with a kitchen behind it. There was no internal bathroom, just an outdoor lavatory built onto the back of the bungalow. When they first moved in there were no mains services in the road – no water, mains drainage, gas or electricity – and of course the road itself was unmade, remaining so until the early 1960s. Water came from a well on the northern boundary of the plot and lighting and cooking were fuelled by paraffin. Harry Martin worked as a clerk for the Port of London Authority and commuted to London by train, walking daily to and from Benfleet Station. He was a man with many hobbies and interests, an enthusiastic amateur photographer and a keen gardener. 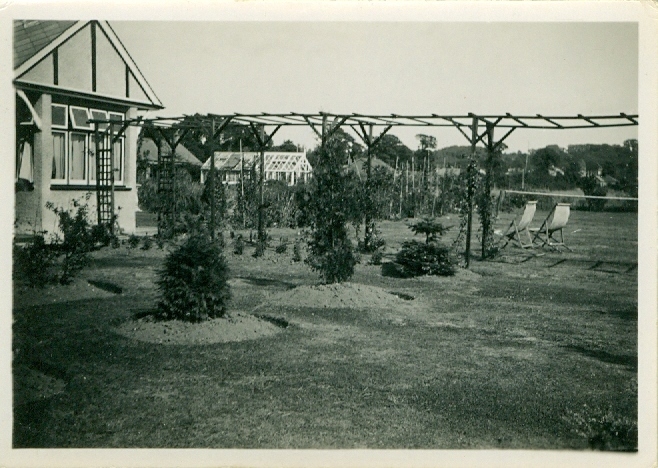 Within a few years of moving in he’d built a greenhouse and created a beautiful garden. 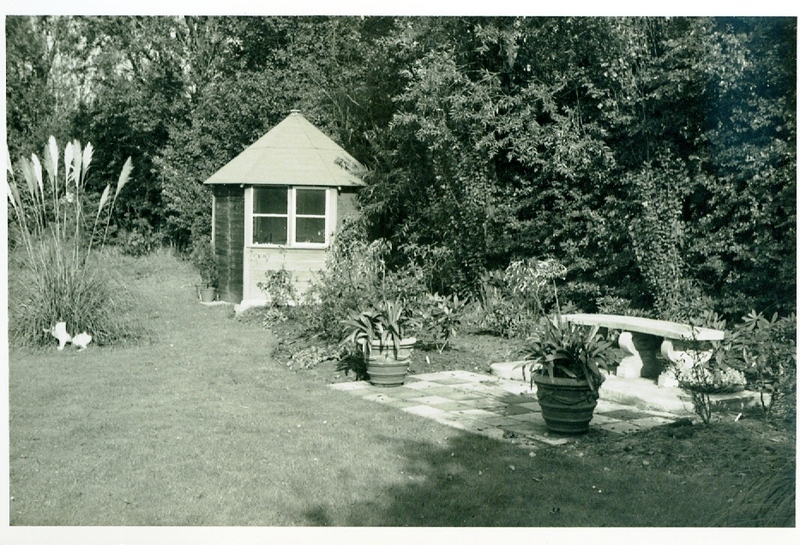 He planted lots of trees on the boundary of the plot, dug beds stocked with unusual shrubs and flowers and built a large, rose-covered pergola and a summerhouse with a thatched roof. 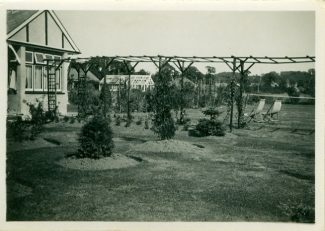 The lawn in front of the bungalow was laid out as a tennis court, complete with net and white lines, which was enthusiastically used and enjoyed by the sisters, aunts, uncles and cousins who were frequent visitors from London. 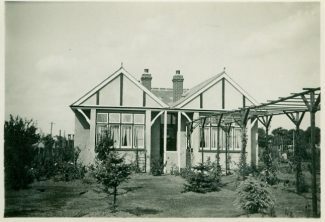 In the early 1930s shortly after Harry’s father retired, his parents, Harry (Snr) and Isabella, moved from London to Hadleigh where they bought a bungalow in Mornington Crescent. In 1933 Harry and his father, a former builder, added a two-room extension to the front of “Shandon” consisting of a third bedroom on the left and a second living room on the right. Presumably by this time mains water and drainage had been laid on because a section at the back of the kitchen was partitioned off and turned into an internal plumbed-in bathroom. It was probably also around this time that gas was laid on, which was used for lighting and cooking, and hot water was provided by a gas-fired Ascot in the kitchen. Eventually electricity was connected, although I’m not sure when that was. The third bedroom, at the back of the house, was converted into a workshop with wood and metal-turning lathes and he also had a small forge. 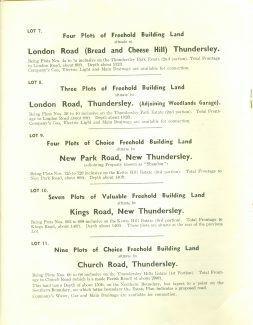 In 1938 the Martin’s bought several additional plots of land adjoining their garden in New Park Road, and several more plots to the rear, fronting onto what was then King’s Road, now Stanway Road. 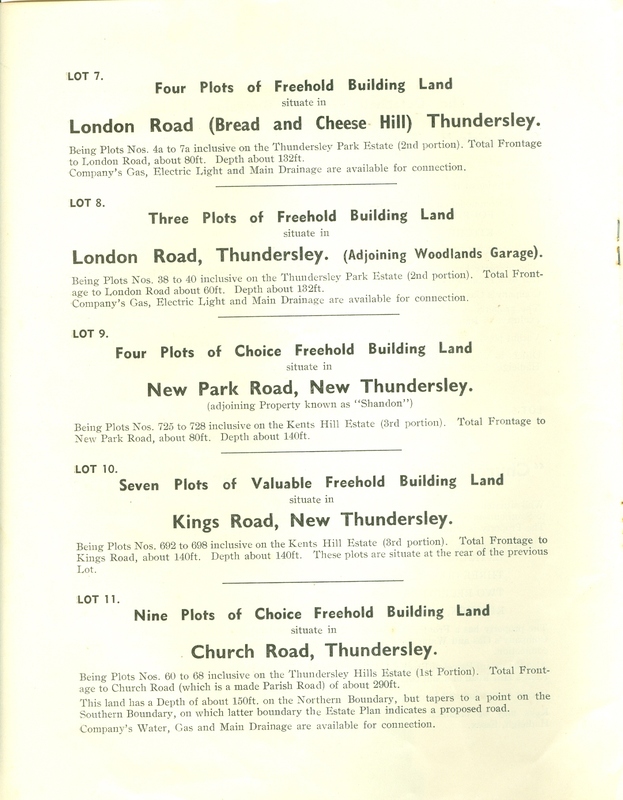 These plots had been offered for sale at auction two years earlier in 1936. 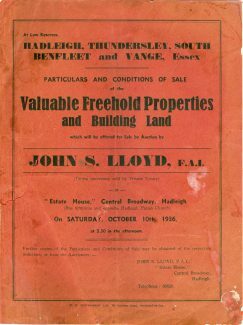 I don’t know whether the family actually bought the plots at the auction or whether they were subsequently purchased from the winning bidder, but my mother-in-law said that her father paid £90 for them. The new land was cultivated for food production. To the front, nearest to New Park Road, was a large vegetable plot and soft-fruit area. The remaining ground was cleared and planted with a variety of apple, pear and plum trees. In addition they built a large wooden shed housing chickens and ducks, which roamed the orchard area, and also caged rabbits. There were several productive beehives from which honey was extracted each summer. All in all the family was largely self-sufficient during the war years when food was rationed. 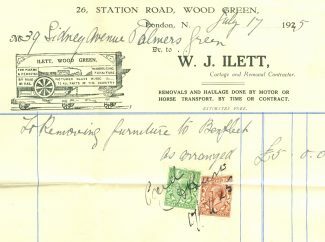 Beattie died in 1958, around the time that Harry retired from the PLA. 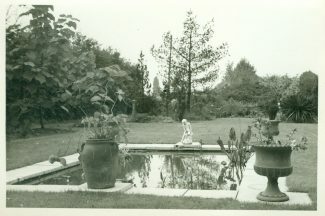 His interest in gardening continued throughout his retirement and he converted the old tennis court into an ornamental garden with a formal pond. He bought a second greenhouse, initially for growing orchids but later housing his large collection of cacti, becoming a member of the Benfleet Cactus Society. Harry died in November 1973 at the age of 79. 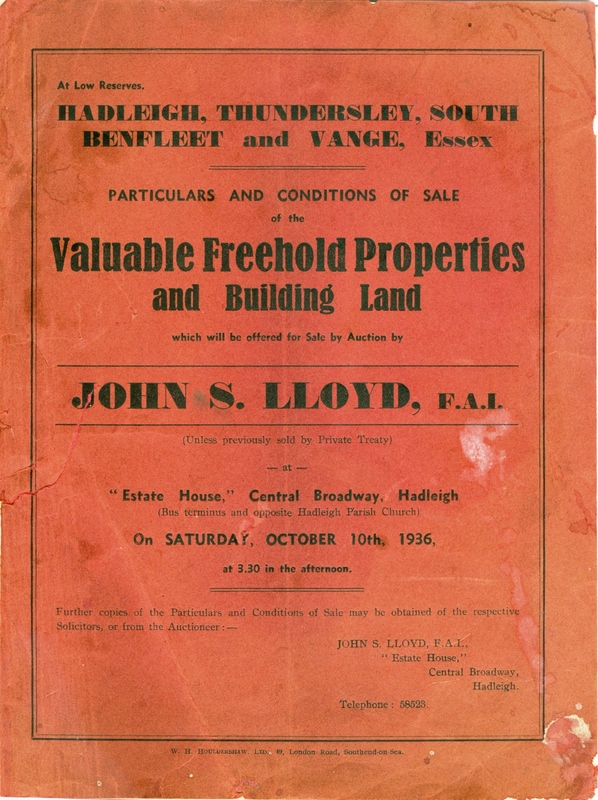 “Shandon” was sold the following year and was demolished to make way for two modern detached houses. However, a few mature trees from his wonderful garden still survive today.